• Recreational anglers in Massachusetts catch and release over 13 million fish each year! • Sometimes fish die from their hook wounds after they are released back into the ocean. • Circle hooks can help lower the number of these kinds of deaths by 50%! When using live bait, turn the hook through soft flesh or bridle the bait to the hook. For cut-bait, rotate the piece completely onto the hook to ensure it doesn’t fall off. When the fish takes the bait, be patient and don’t set the hook. Calmly reel the line tight and the hook will do all the work. 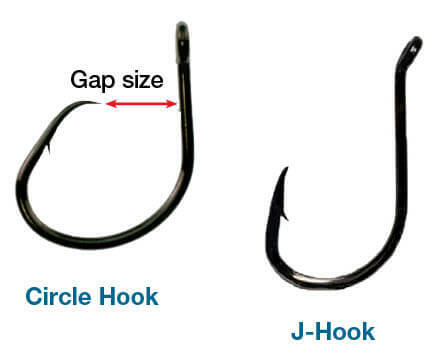 What species benefit from Circle Hooks? Fish that eat by inhaling their food are good candidates for circle hooks. Why Don’t Circle Hooks Snag? Circle hooks are designed so that the point is turned back towards the shank at a 90° angle. This causes the hook to catch on the lip or mouth instead of the gut or gills. 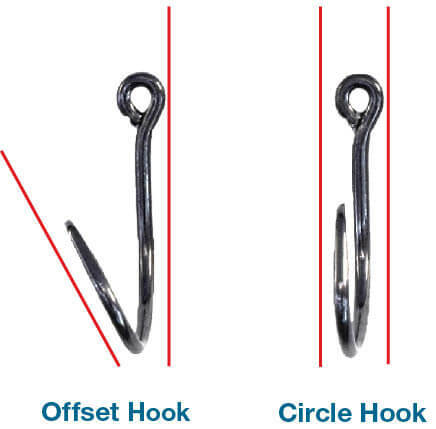 Offset hooks are NOT true circle hooks! The offset shape makes it easy to “foul-hook” a fish.